CHICAGO – Peter Morgan’s play “Frost/Nixon” was a searing portrait of two men trying their best to change their image and their future. It was a head-to-head battle between a celebrity interviewer whose reputation was on a steady decline and the man credited with bringing shame to the White House. Either Richard Nixon would “win” and come out looking like he had successfully defended his controversial actions in his last few years in office or David Frost would give the impeached President the trial that a lot of people feel he deserved. Clearly, there’s enough drama inherent in the source material of “Frost/Nixon” to make a riveting drama, and the cast that director Ron Howard and Morgan, adapting his own play, have assembled are more than talented enough to pull it off. But something gets lost on the way from the theater to the multiplex. There’s a passion in the war of words between these two driven men that feels diluted by not only the big screen but also Howard’s weaknesses as a director. 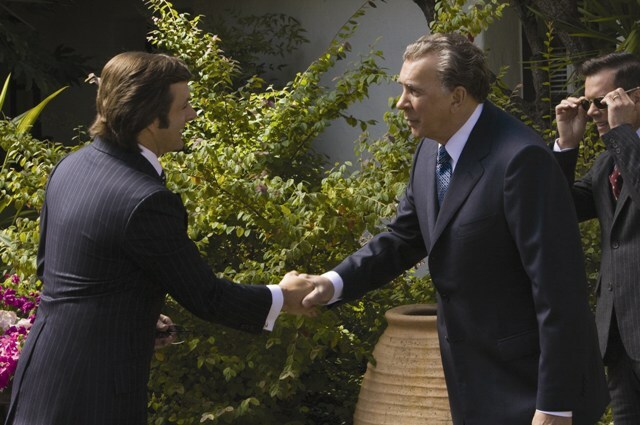 David Frost (Michael Sheen) greets Richard Nixon (Frank Langella) and Colonel Jack Brennan (Kevin Bacon) in “Frost/Nixon”, from director Ron Howard. Photo credit: Ralph Nelson. Copyright: © 2008 Universal Studios. Michael Sheen plays David Frost, a man in the midst of a career crisis. He’s a reasonably successful celebrity interviewer, but he’s not taken as seriously as he’d like to be. When he sees Richard Nixon (Frank Langella) resigning on national television and realizes what a ratings draw he is worldwide, he reaches out to try and land an interview. After some negotiations, including a few rules on what can be asked and when, he lands the interview of the decade. 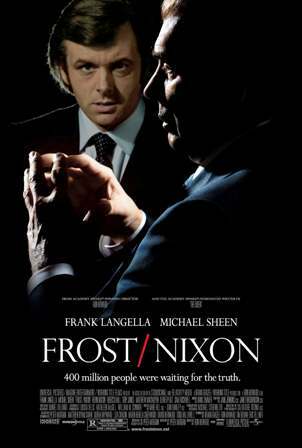 Frost/Nixon from Universal Pictures opens on December 12, 2008. To prepare for the interview, Frost’s team, including producer John Birt (Matthew Macfadyen) and researchers James Reston Jr. (Sam Rockwell) and Bob Zelnick (Oliver Platt), go to work on preparing every question and anticipating every answer while Frost himself hits the town with his gorgeous new lady love (Rebecca Hall). Could Frost’s reputation as a soft-sell interviewer be true? Could Nixon end up using the platform as a way to exonerate himself? “Frost/Nixon” builds to the interviews themselves, easily the most riveting material in the film and an opportunity for two great actors to shine. Langella has already been laden with praise for his work in “Frost/Nixon” and it’s deserving. People who like the film clearly become enraptured with the bone-deep performance by the role of this talented actor’s career. But Langella is not alone. Sheen is very good and great character actors like Rockwell, Platt, Kevin Bacon, and Toby Jones excel in small roles. What keeps “Frost/Nixon” from becoming more than a performance piece is the lack off three-dimensionality and depth that often marks the work of Ron Howard. He’s a classic, three-star director, a man who continues to make movies that are “good enough” but never great. The world of “Frost/Nixon” doesn’t feel lived in and that keeps the film from having the intensity or resonance that it might have from a director with that undefinable ability to make his characters pop off the screen. 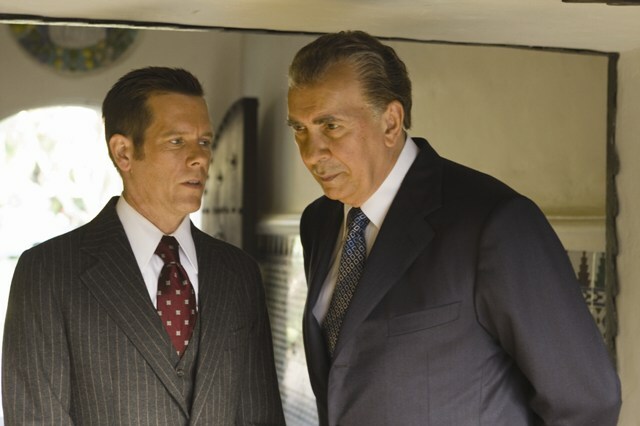 Colonel Jack Brennan (Kevin Bacon) counsels Richard Nixon (Frank Langella) in “Frost/Nixon”, from director Ron Howard. In the end, the inherent drama of the true story of “Frost/Nixon” and the performers assembled to shoot it make the film worth seeing, but it still feels like a missed opportunity. It’s a dramatically inert film because Howard is too often going through the motions instead of breathing life into the piece. It simply never feels like the people in “Frost/Nixon” exist outside the frame or before or after the credits, turning what could have been a realistic portrait of two complex men into just an acting exercise. ‘Frost/Nixon’ stars Frank Langella, Michael Sheen, Rebecca Hall, Sam Rockwell, Oliver Platt, Kevin Bacon, and Toby Jones. ‘Frost/Nixon’, which was written by Peter Morgan and directed by Ron Howard, opened on December 12, 2008.